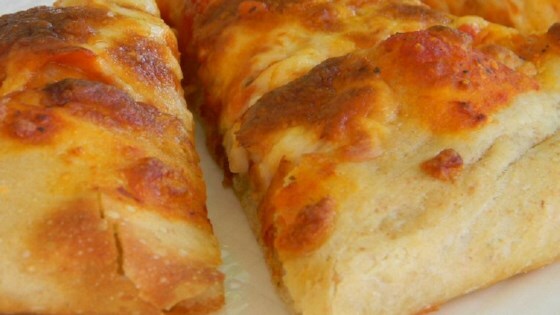 "This pizza dough produces a very nice pizza crust--flavorful, tender, with just the right amount of chewiness." Stir whole wheat flour, all-purpose flour, yeast, salt, sugar, olive oil, and warm water with a spatula until formed into a sticky ball of dough that pulls away from sides of a large bowl, about 3-4 minutes. Cover the bowl with a light cloth or plastic wrap and let rise in a warm place (80 to 95 degrees F (27 to 35 degrees C)) for 18 hours, until doubled in size. Preheat the oven to 550 degrees F (280 degrees C). Sprinkle a baking sheet with cornmeal. Turn the dough onto a lightly floured surface and sprinkle with more flour. Form the dough into a rectangle, and cut it into four equal parts. Shape each piece into a ball, stretching and tucking the dough to create a smooth surface, adding more flour if needed. Cover the dough balls with a towel and let rest for 15 minutes. To shape the dough, sprinkle the surface with flour and lightly pat flat. Use a rolling pin to form a thin disk about 9 inches in diameter. Transfer the formed crust to the prepared baking sheet and top as desired. Bake on the bottom rack for 4 minutes, move to the middle rack and bake for 5-6 minutes more minutes, until the bottom is crispy and the top is lightly browned. Move to cooling rack to cool slightly before serving. Additional all-purpose flour may be needed if the dough is too sticky and wet. This recipe was excellent! When baking it's important to weigh the flour. If you don't have a food scale, the texture of the dough will tell you if you've added too much flour.